Small - $39.99 Only 1 left! Medium - $39.99 Only 6 left! Large - $39.99 Only 3 left! Are we the only ones around here who think that TIE fighters are just a little bit cooler-looking than the X-Wing fighters the Rebellion flies? Maybe a lot cooler-looking? Of course we're not the only ones! Because TIE fighters are totally awesome. That menacing scream they make when they zip into firing range is one of the most dreaded sounds in the galaxy, and there's no more terrifying sight than an entire fleet of them taking off from a Star Destroyer like a swarm of angry bees. They're fearsome and fast, and we can't blame anyone for wanting to fly one. For those kids who can't resist the idea of joining up the Empire's elite fighting squadron, we heartily and excitedly recommend the Star Wars Rebels Deluxe Child Tie Fighter Pilot Costume! 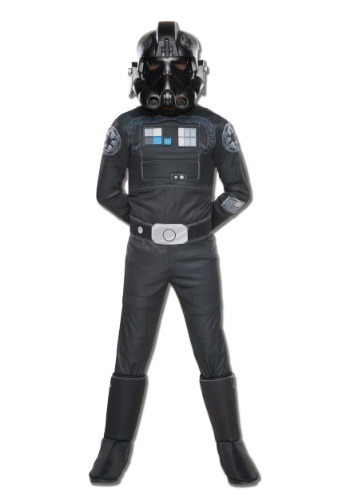 Your kid's transformation to the Dark Si... er, we mean expert Imperial pilot will be quick with this costume. With only three pieces, it's easy to put on and wear, but looks as menacing as the real thing. The outfit includes the black jumpsuit with the foam boot tops attached, a belt, and of course, the iconic TIE fighter helmet. Because if you have to jump ship and come face to face with the enemy, you want to strike fear into their hearts before they can even consider taking you on hand-to-hand! And if it's one thing the Empire is known for, it's outfitting its stormtroopers and pilots (oh, and that guy Darth Vader) in sinister-looking masks. So this Halloween, help your little pilot realize his dreams of joining the Empire with the Star Wars Rebels Deluxe Child Tie Fighter Pilot Costume!